VIVA SOL. Translated: "Long Live the Sun." And long live all the fun you can have under it. Viva Sol creates memorable outdoor experiences by combining craftsmanship with gamesmanship. Our sole passion is taking time-honored hand toss games to a higher level of performance and artistry. Constructed from 100% wood and steel designs, the entire Viva Sol collection is built to endure, and to bring family and friends together. 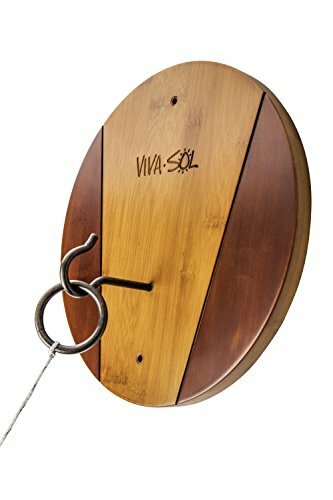 Our oil rubbed bronze hook and ring set features a beautifully designed 8" diameter all wood target with a walnut finish and can be assembled in minutes. The set includes one premium wood target, one bronze ring, one bronze hook and one rope. If you have any questions about this product by Viva Sol, contact us by completing and submitting the form below. If you are looking for a specif part number, please include it with your message.